Fertilizer industry has a crucial role to play in addressing global food security challenges, as the world’s population continues to expand rapidly, driving demand for nutrition and resource availability, said top experts at the ninth edition of Gulf Petrochemicals and Chemicals Association (GPCA) Fertilizer Convention in Muscat, Oman. The three-day event was yesterday (September 18) inaugurated by Dr Fuad Bin Jaafar Bin Mohammed Al-Sajwani, Minister of Agriculture and Fisheries, Oman. More than 300 delegates from 30 countries are taking part. 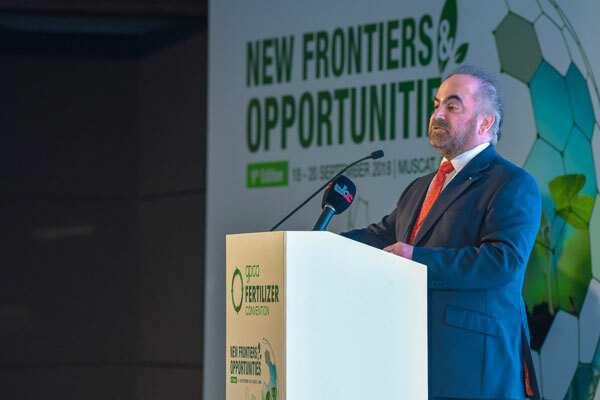 In line with this year’s theme “New frontiers and opportunities”, the convention highlighted recent developments in the global and regional industry landscape, consolidation within the agri-nutrients business, sustainable agricultural solutions and opportunities for improvement in the fertilizer value chain. Delivering the welcome address, Salim Al Aufi, the undersecretary, Ministry of Oil and Gas, Oman, urged the industry to be ready for the tremendous population growth that is set to occur globally. "We need to be prepared for the challenge that lies ahead of us and ensure that we have enough food for the 10-12 billion people that will be living on this planet in the next 30-40 years to come," he stated. Global agricultural production will need to more than double by 2050 in order to meet growing demand for food, as the world’s population is expected to reach 9.7 billion people over the next three decades. By 2050, demand for water will grow by more than 100 per cent, with the majority of the population living in cities due to rapid urbanization. This is creating significant opportunities for the fertilizer industry to respond to these challenges with a new generation of sustainable fertilizer products tailored towards increasing agricultural productivity, while addressing climate change, land degradation and decreasing water resources, speakers said. In his address, GPIC President Dr Abdulrahman Jawahery said the fertilizer industry was arguably one of the most important industries globally. "Fertilizers provide food security and nutrition for the global population, bring prosperity and growth to the agricultural sector, and – if applied in an efficient manner – help preserve our planet’s ecosystems," remarked Dr Jawahery, who is also rthe vice chairman of GPCA. "In the next years, the role of the fertilizer industry in ensuring global prosperity will increase tremendously as the global challenges we face today are becoming ever more complex and difficult to address," he noted. “Without fertilizers more than half of current food production would be compromised, which highlights the industry’s irreplaceable role in providing nutrition to billions of people on the planet. Our products are the essential engines of agricultural productivity. Fertilizers, if correctly used, can significantly protect and enhance a nation’s soil resources. This is particularly important for our region, as we live in an environment characterized by harsh climate conditions and scarce water resources,” he added. John Baffes, the senior economist at World Bank (Development Prospects Group), highlighted the industry’s efforts to meet rising demand for food in line with the UN Sustainable Development Goal 2 (SDG 2) which focuses on ending hunger, achieving food security and improved nutrition, and promoting sustainable agriculture. He also urged the industry to look for more differentiated approaches to address emerging global challenges. Oman Oil Company CEO and Oman India Fertiliser Company (Omifco) Chairman Engineer Isam bin Saud Al Zadjali said: "It is with great pride that the Sultanate of Oman is hosting the GPCA Fertilizing Convention for the first time. By Omifco being a member of this prestigious association, we are privileged to partner with GPCA to host this large-scale event." "This platform provides a significant opportunity to shed light on Oman’s local economy and its growing fertilizer and petrochemical industries; it is also an important occasion to exchange knowledge and best practices in the sector," he noted.